Following the United Kingdom, Denmark, Germany and Belgium, Norway is the 5th European country to start selling the world’s first fuel cell sedan. 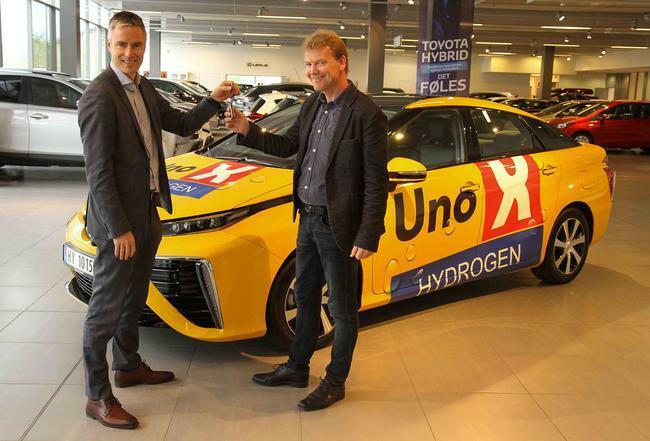 The first car has been delivered to Uno-X Hydrogen, a company that builds refuelling stations. In addition to its plan to open 20 public hydrogen stations in Norway by 2020, Uno-X Hydrogen will soon start building the world’s first hydrogen station powered by surplus renewable energy – adding the benefits of an increased environmentally friendly hydrogen production process to the car’s zero emissions. Norwegian Government underpinning the creation of a hydrogen society by supporting roll-out of a nationwide hydrogen refueling infrastructure and by offering a range of benefits to fuel cell car drivers (tax reductions, free toll roads and public parking. The country has plans to sell 50,000 fuel cell cars by 2025.